Antique photographs can come with unique distinctions that suggest that they were made during the Civil War era. Neither of these photographs has been identified, but both come from a photograph album, purchased at an antique shop, with ties to the family of Jesse M. and Elizabeth Jane (Baker) Smith of Mount Pleasant, Henry County, Iowa.1 Both provide excellent examples of the ways in which Civil War era photographs might be marked or otherwise adorned. 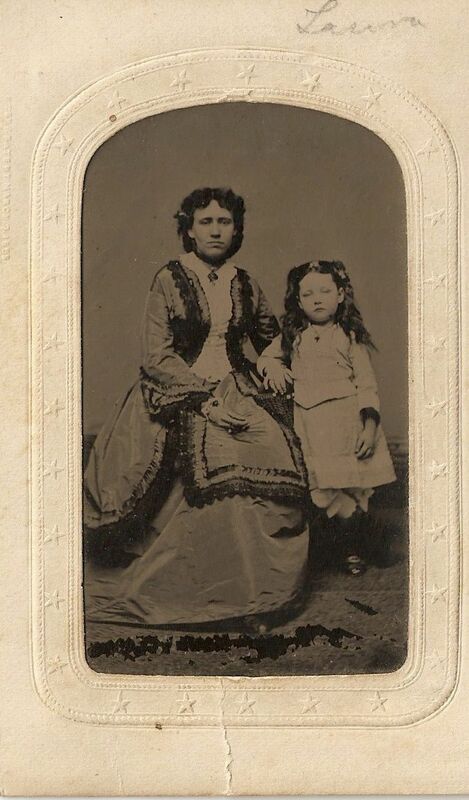 Unidentified tintype of woman and child, ca. 1865; digital image 2012, privately held by Melanie Frick, 2013. The first image in the album, which features a woman and, presumably, her young daughter, is set inside an embossed white paper mat with a patriotic pattern of stars. An embossed notation on the side of this mat states that it was patented 7 March 1865, suggesting that the tintype was made shortly thereafter.2 The woman has crimped her hair at the temples in a manner that was popular in the latter half of the decade,3 and the young girl, perhaps six years old, wears her hair long and loosely curled. While the mother is corseted and in a fine gown supported by a hoop skirt, the daughter is dressed in a much looser – and more comfortable – style, though she also wears jewelry as well as what appears to be flowers or decorative combs in her hair. The name “Laura” is handwritten in pencil near the top of the mat. 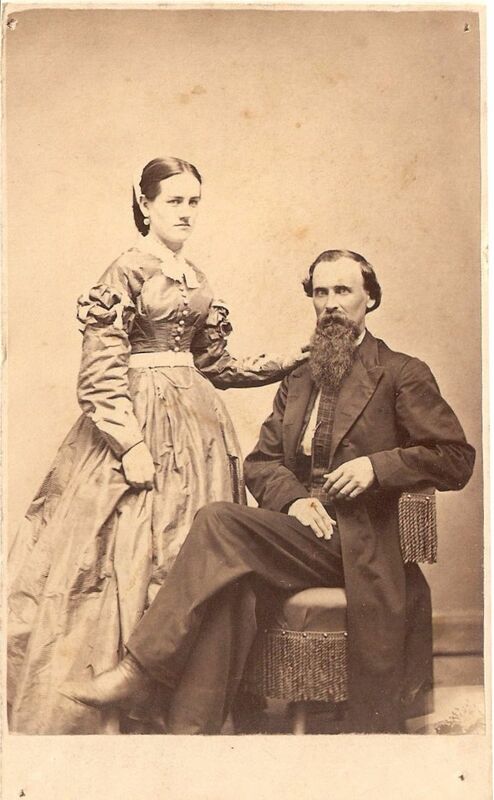 Unfortunately, the only Laura that I could find directly related to the couple associated with this album was not born until 1867.4 Perhaps there was another Laura in the extended family, or perhaps it was labeled as such simply because it came from “Laura’s side of the family,” as opposed to, for example, the family of her spouse. Regardless, the relationship between the mother and daughter pictured here, dressed in their best during a tumultuous period in American history, can still be appreciated today. 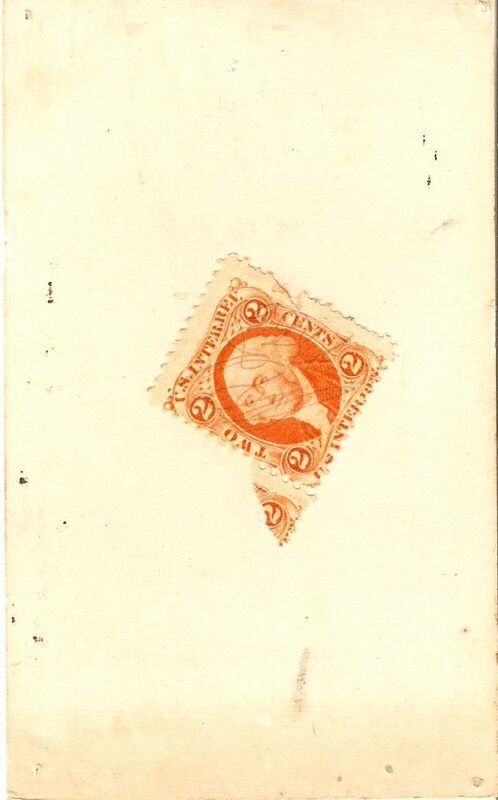 Tax revenue stamp of unidentified photograph of couple, 1866; digital image 2012, privately held by Melanie Frick, 2013. Unidentified photograph of couple, 1866; digital image 2012, privately held by Melanie Frick, 2013. This photograph has tack holes in each of its four corners, suggesting that it was put on display at one time, tacked up perhaps on the wall of a home or on a writing desk. Evidently, in the years before it made its way into an album and was subsequently forgotten, this photograph was important enough to someone that he or she wished to look upon it every day. Today, we are left to wonder what became of the couple pictured within, and why they chose to have their photograph taken on this day in 1866, not long after the conclusion of the Civil War. What signs of the Civil War era have you spotted in a photograph? 1 Jesse M. and Elizabeth Jane (Baker) Smith Album, ca. 1860-1920; privately held by Melanie Frick, 2013. 2 “What Do You Know About Tintypes?,” Ohio Historical Society Collections Blog, 5 August 2011 (http://ohiohistory.wordpress.com/2011/08/05/what-do-you-know-about-tintypes/ : accessed 13 September 2013). 3 Joan Severa, Dressed for the Photographer: Ordinary Americans and Fashion, 1840-1900 (Kent, Ohio: Kent State University Press), 206. 4 1870 U.S. census, Henry County, Iowa, population schedule, Center, p. 14, dwelling 109, family 109, Laura B. Smith; NARA microfilm publication M593, roll 395. 5 Severa, Dressed for the Photographer, 209. 6 Severa, Dressed for the Photographer, 206. 7 Maureen A. Taylor, Family Photo Detective (Cincinnati: Family Tree Books, 2013), 54-55. This entry was posted in Photograph Analysis and tagged 1860s, Civil War, family history, genealogy, tintype, unidentified on September 13, 2013 by Melanie Frick. Maybe we should follow each other. 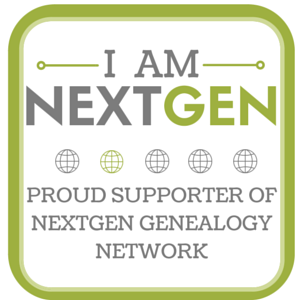 I’m on pinterest as well and specialize in genealogy boards. 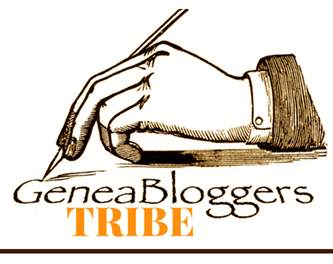 I have one on photos, civil war, revolutionary war, war of 1812, humor, resources, and many others.